Located in South Lake Tahoe in the California region Tahoe Tree House features a balcony. The holiday home is in an area where guests can engage in activities such as golfing cycling and tennis. This holiday home is fitted with 3 bedrooms a living room and a fully equipped kitchen with a dishwasher. A TV with satellite channels is featured. The holiday home offers a fitness centre. 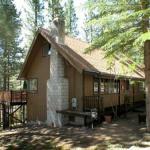 BBQ facilities can be found at Tahoe Tree House South Lake Tahoe along with a children's playground. Washoe Meadows State Park is 3.9 km from the accommodation while Heavenly Ski Resort is 5 km from the property. The nearest airport is Reno-Tahoe International Airport 70 km from the property.